The European-Asian Journal of Law & Governance is a peer-reviewed academic journal published by the German-Southeast Center of Excellence for Public Policy and Good Governance (CPG) in Bangkok. It appears in print and, free of charge, online. The Journal’s scope is twofold, covering strictly legal topics as well as developments at the intersection between political science, governance studies and law. What unites all articles, comments, essays, case-notes, reviews and research material, however, is the common aim to explore the foundations and boundaries of norm-based orders, the challenges – big and small – in the implementation of the rule of law and the constant tension between law and power. The Journal’s mission is to provide a forum for debates in constitutional and administrative law, criminal and procedural law, anti-corruption and compliance, human rights, geopolitics and international law as well as regional integration. It combines perspectives from Europe and Asia, including transnational and comparative perspectives. Contributors to the Journal are scholars and practitioners from diverse fields and backgrounds, enhancing the Journal’s interdisciplinary scope. 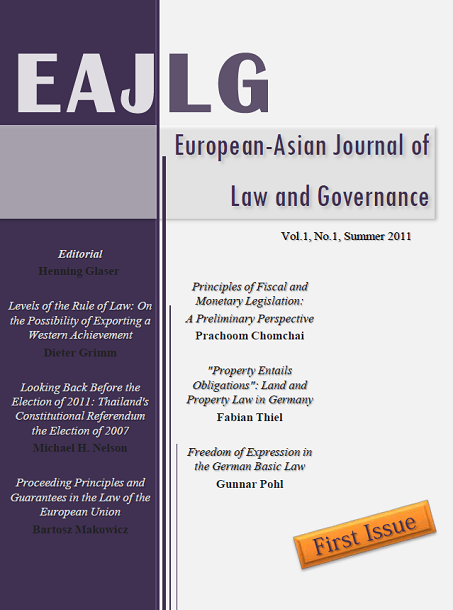 The European-Asian Journal of Law & Governance is the product of a common effort involving the editors in charge of developing the Journal’s content, anonymous peer-reviewers from many universities in various European and Asian countries, the editorial board and the editorial staff in Bangkok. We hope you enjoy reading our Journal, we would be thankful for your feedback and we invite you to let us know if you have suggestions for topics to be covered or improvements. The European-Asian Journal of Law & Governance welcomes submissions of high quality. Submissions must be in English and may include articles, comments, essays, case-notes and reviews within the Journal’s thematic scope. Unsolicited submissions can be sent to: eajlg@cpg-online.de. Unsolicited submissions are reviewed in a double-blind peer-review procedure after a first screening by the Journal’s editors. The review of an article usually takes between four to six weeks. The Journal reserves the right to review texts for as long as necessary to reach a publication decision and to return articles unpublished if they do not meet the Journal’s standards. The Journal receives submissions with the understanding that the content is original, unpublished material and has not been submitted for publication elsewhere, whether in print or in electronic form. Authors intending to republish articles, or to use previously published material as part of an article, must indicate this intention at the time they accept the invitation to publish or, in the case of unsolicited articles, at the time of submission. The Journal reserves the right to edit submissions. Authors are granted the opportunity to review corrections before publication. The European-Asian Journal of Law & Governance retains the copyright over its publications, including each full issue and the individual pieces. Republications of any material originally published in the Journal require the permission of the Journal’s editors. Authors submit their manuscripts as a Microsoft Word document (.doc or .docx) via email to submissions@eajlg.de. Authors must use American English spelling (-ize, not -ise). Manuscripts should be saved in plain formatting, i.e. without automatic hyphenation, automatic indexing of section headings, or activated hyperlinks or macros. Footnotes contain the abbreviated first names and the full last names of authors/editors, book and/or article name, journal name, additional publication information (i.e. editors, volume number, edition number), case names, court information, place and year of publication. Each citation must refer to a specific page number. General references must be cited as “See generally”. References to prior or subsequent footnotes use the format “supra/infra note 12”. Subsequent citations to the same source must be signaled by Ibid. N. Petersen, Proportionality and Judicial Activism, Cambridge 2017, at p. 39. D. Grimm, Values in German Constitutional Law, in: D. Davis et al. (eds. ), An Inquiry into the Existence of Global Values, Oxford 2015, pp. 199 – 214, at p. 211. M. Heger, Terrorist Attacks Against the Natural Environment: A Phantom or a Real Danger, German Law Journal, Vol. 13 No. 09 (2012), pp. 1066-1074, at p. 1069. ECtHR, Republican Party of Russia v. Russia, judgment of 12 April 2011, Application No. 12976/07, at para. 52.